Of all of the critters we have, the ones struggling the most with the move are the Pyrs. I feel really bad for them because it must be really, really confusing. They were so bonded to our place in NH, so comfortable, so relaxed. Moving once was really hard, moving twice is so very stressful. We learned some stuff the first time, though, and are trying to make it as okay as we can, and it is sort of working. First off, I’m keeping them tethered at different spots around the place so they can get used to it without feeling like they are in charge. When they are tethered, they act very different than when they roam free, understandably. They don’t really like it but they aren’t miserable, as long as I move them often enough that they can see all of the interesting things going on at some point, not be stuck somewhere and kept in the dark when Something Happens. I’ve got three different spots with an overhead run and I move them around several times during the day. They have shelter, food and water at each spot and are pretty relaxed these days. Second, I give them supervised run around time as I can, one at a time. All of our fencing is currently in rolls on the ground and not put up, so I can’t really let them off leash at all because they all make a bee line for the road — I hate their fascination with the road, but all three of them have it. They love to chase cars and I’m doing everything I can to make sure they can’t do it. If they can do it along the inside of a fence line, they actually love that even more, so I want to set it up so that’s okay. The barking, though, is sort of horrid. They don’t know what sounds are normal yet, so they bark at everything, all the livelong day and night. It’s the mailman! A jogger! A school bus! We are right on Route 44, so plenty of street traffic and evidently it all needs to be barked at still. I know they’ll get used to it all soon enough, but man does it feel like it takes forever. I’m trying to spare the neighbors and putting them in the barn or just moving them when it gets to be too much. They are also announcing to all of the resident wildlife that there are new sheriffs in town. There was quite a howling party going on this morning around three, coyotes and all three Pyrs howling in chorus. The geese were answering as well. It’s no wonder I couldn’t sleep. It’s really hard on Buffy and Faith in particular because they are so bonded to each other that it’s really hard for them to be separated. But I can’t keep them too close to each other because they’ll get tangled in the lead lines. I try to give them time to play a couple of times a day, and will also put them in a stall together when it’s miserable and rainy out. They are adorable with the hugs and kisses and OMG I missed you SO MUCH! Silly sisters. It was only a couple of hours apart! When I’m out doing chores, I have been able to let Maggie roam free for a bit. She’s the least likely to take off, the most mature. But she too is fascinated with the road and if I turn my back, she’ll head down to check it out. So, we obviously need to get our fencing in place. It’s really hard because of how late in the year it is. The ground is going to freeze any second. It hasn’t yet, though, so we are constantly working on it. But with Frank working all day and it’s pitch black by the time he gets home, it’s slow going. If you are in the area and able to help, we are having a fencing party on the Saturday between Christmas and the end of the year, December 29th at 10 am until whenever. We’ll feed you! Provide beer! Come see the new place? Everyone is invited. We could really use the help. The Pyrs will be ever so grateful. 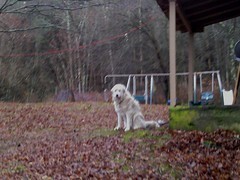 We are reaching out to National Great Pyr Rescue as well. This entry was posted in Dogs, Fencing. Bookmark the permalink. Post a comment or leave a trackback: Trackback URL.